There is loads to see and do when you stay at Glenview Lodge. The village of Broadford is 2kms from Glenview Lodge, have a drink in one of the local pubs or stroll through the arboretum and view the native trees and shrubs. An area steeped in heritage visit the Mass Rock and Killagholehane Church ruins. Meet friendly and welcoming people, Gaelic games played regularly. Walking holidays are popular .The trails are called ‘The Broadford Ashford Walking Trails’ with each route carefully selected to include at least one of the mountains peaks with the best scenery and interesting pathways including an arboretum of native trees.Visit http://walkbroadfordashford.com/for more information. Scenic drives through attractive small towns and villages. Local castles, holy wells that date back to pre Christian times and historical buildings. Local towns have boutiques and craft shops.Enjoy the relaxed easy pace of life. We are in the centre of an area where you can enjoy crafts, antiques, and boutiques and also thatched cottages in Adare. Golfing in Ireland has a mystical quality and many golf courses both links and parkland are within easy reach. This rural area offers traditional markets and visitor farms. Your cultural journey can include museums and commemorative sites, Irish music and dance and literary festivals. Hill walking and garden visits can be included as well as fishing and equestrian activities. 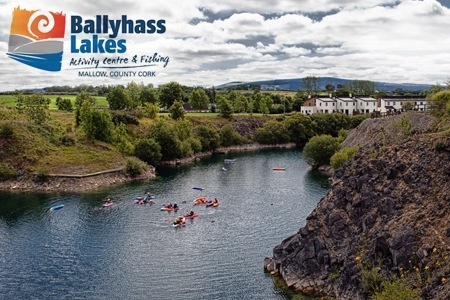 Ballyhass Lakes and Bleach Lough are two popular fishing lakes. This is available in the general district including horse racing, hunting and equestrian centres. Limerick Racecourse 40 mins drive (40km). Cork Racecourse 35 mins. drive. (30km). These are available in the general district. Stonehall Visitor Farm, Kilcornan, Co. Limerick. Combat Zone. This is a challenging paintball adventure in the woodlands in Shanagolden. Newcastle West, Charleville, Kanturk and Adare within 1/2 hour drive. World renowned championship and links courses include Ballybunion,Lahinch, Old Head of Kinsale within easy access. Visit The Thomond Park Museum. Limerick Track 1 hour drive away. The towns and villages in the Shannon Region host an array of different festivals which display the unique culture of Ireland. The following is a list of some of these. • Puck Fair at Killorglin. • St. Patrick’s Day Celebrations. • Magic of Christmas Folk Parks. • Irish Coffee Festival Foynes. • Horse and Pony Racing Broadford. • Storytelling Festival at Lough Gur. • Eigse Literary Festival Newcastle West. • Horse Racing in Mallow and Limerick. Restaurants for all tastes and budgets are available using local produced quality food. Select an award winning gourmet restaurant a medieval castle banquet or local pub grub. Brown Morel Newcastle West. Cronin’ Bar Newcastle West. The Silver room Newcastle West. Foley’s Bar and Restaurant Reens Pike just off N21 Adare to Newcastle West Road. Nevilles’ Bar and Restaurant Nevilles’ Cross between Adare and Ballingarry. The Forge (Daytime) Restaurant and Crafts Shop Charleville. The Park Hotel Charleville. Cascada Charleville.